Mission Basilica San Diego de Alcalá was the first Franciscan mission in the Las Californias Province of the Viceroyalty of New Spain. Located in present-day San Diego, California, it was founded in 1769 by Spanish friar Junípero Serra in an area long inhabited by the Kumeyaay Indians. The mission and the surrounding area were named for the Catholic Saint Didacus, a Spaniard more commonly known as San Diego. The mission was the site of the first Christian burial in Alta California. San Diego is also generally regarded as the site of the region's first public execution, in 1778. Father Luís Jayme, "California's First Christian Martyr," lies entombed beneath the chancel floor. The current church is the fourth to stand on this location. The Mission is a National Historic Landmark. The former Spanish settlement at the Kumeyaay's Nipawai lies within that area occupied during the late Paleoindian period and continuing on into the present day by the Native society commonly known as the Diegueño; the name denotes those people who were ministered by the padres at Mission San Diego de Alcalá. Relatively, much is known about the native inhabitants in recent centuries, thanks in part to the efforts of the Spanish explorer Juan Rodríguez Cabrillo, who documented his observations of life in the coastal villages he encountered along the Southern California coast in October 1542. Cabrillo, a Portuguese navigator in the service of Spain, is credited with the discovery of San Diego Bay. On the evening of September 28, 1542 the ships San Salvador and Victoria sailed into the harbor, whereupon Cabrillo christened it "San Miguel." During that expedition a landing party went ashore and briefly interacted with a small group of natives. Some sixty years later another Spanish explorer, Sebastián Vizcaíno, made landfall some ten miles from the present Mission site. Under Vizcaíno's command the San Diego, Santo Tomás, and frigate Tres Reyes dropped anchor on November 10, 1602, and the port was renamed "San Diego de Alcalá." It would be another 167 years before the Spanish returned to San Diego. Ever since the voyages of Christopher Columbus, the Kingdom of Spain sought to establish missions to convert the pagans in Nueva España ("New Spain") to Roman Catholicism in order to facilitate colonization of these lands. However, it was not until 1741—the time of the Vitus Bering expedition, when the territorial ambitions of Tsarist Russia towards North America became known—that King Philip V felt such installations were necessary in Upper California. Finally in 1769 Visitador General José de Gálvez sent the expedition of Junípero Serra and Gaspar de Portolà to found a mission at San Diego and presidio at Monterey, respectively, thereby securing Spain's claim to the entire Pacific Coast by right of discovery. Two groups traveled from Lower California on foot, while a pair of packet ships (bearing supplies) traveled up the coast from the Baja Peninsula. "Four Fathers, Fr. Juan Crespí, Fr. Fernando Parrón, Fr. Francisco Gómez, and I, are here, ready to found a second mission, if the ships arrive. Should we see that hope and supplies are vanishing, I shall remain here alone with Fr. Juan Crespí and hold out to the very last. May God give us His holy grace. Recommend us to God that so it may be..."
Serra feared that if San Diego were abandoned, "..centuries might come and go before the country would again be revisited...;"finally, just before sunset on the 19th, the San Antonio entered the harbor. The ship had been bound for Monterey to deliver supplies to the expedition waiting there, but had lost one of its anchors and was forced to make port in San Diego, where a spare anchor from the San Carlos could be retrieved. With the settlement now properly outfitted with supplies, the missionaries set about constructing permanent buildings at Kosoi, in 1773 the site of California's first Christian burial. The Mission was relocated to its present location (the native village of Nipawai) in August 1774. The lack of a dependable water supply, coupled with the proximity of the military personnel at the presidio, led Father Luís Jayme to seek permission to relocate the mission from its original site, to the valley some six miles upriver to the east, where it remains today. Almost immediately there was a noticeable increase in the number of baptisms, which in 1775 totaled 431 (compared to 274 for the preceding four years combined). Native resistance continued almost unabated. At approximately 1:30 a.m., on the moonlit night of November 4, 1775 between 600 and 800 warriors from the surrounding rancherías silently crept into the mission compound. After plundering the chapel, they set the other buildings ablaze. The commotion soon awakened the two missionaries, the Spanish guards, and the Christian neophytes. Fray Jayme (who had been left behind to run the Mission while Father Serra moved on to found other missions) was killed in the melee, thereby making him California's first Christian martyr. The Mission buildings were reduced to ashes, and all records and manuscripts lost in the blaze; the censer, the chalice used at Holy mass, and the pieces of coin used during marriage ceremonies were "melted into a solid mass." The following February, one of the neophytes who had participated in the assault repented and sought refuge in the jacal then being used for Divine service. Captain Rivera refused to recognize the native's claim of sanctuary, reasoning that "...the [place] where Holy mass was celebrated was not a church but a warehouse." Though threatened with excommunication, Rivera remained determined to remove the Indian (by force if necessary) and did so personally on March 26, 1776. Seeking to have his excommunication lifted, he traveled to Monterey to bring the matter directly before Father Presidente Serra. After hearing the captain's arguments and reviewing several letters sent by the Mission fathers regarding the incident, Serra decided that Rivera was to return the prisoner to the church in San Diego, and that Fathers Font and Fustér would thereupon lift the excommunication. San Diego achieved the reputation early on as site of the region's first public execution, one it may not deserve. On April 6, 1778 four native chiefs of Pámo, one of San Diego's Indian rancherías, were convicted of conspiring to kill Christians and were sentenced to death by José Francisco Ortega, Commandant of the Presidio of San Diego; the four were to be shot on April 11. However, there is some doubt as to whether or not the executions actually took place. José María de Echeandía, the first native Mexican to be elected Governor of Alta California, issued his "Proclamation of Emancipation" (or "Prevenciónes de Emancipacion") on July 25, 1826. All Indians within the military districts of San Diego, Santa Barbara, and Monterey who were found qualified were freed from missionary rule and made eligible to become Mexican citizens; those who wished to remain under mission tutelage were exempted from most forms of corporal punishment. Catholic historian Zephyrin Engelhardt referred to Echeandía as "...an avowed enemy of the religious orders." Although Governor José Figueroa (who took office in 1833) initially attempted to keep the mission system intact, the Mexican Congress nevertheless passed An Act for the Secularization of the Missions of California on August 17, 1833. The Act also provided for the colonization of both Alta and Baja California, the expenses of this latter move to be borne by the proceeds gained from the sale of the mission property to private interests. On August 9, 1834 Governor Figueroa issued his "Decree of Confiscation." The missions were offered for sale to citizens, who were unable to come up with the price, so all mission property was broken up into ranchos and given to ex-military officers who had fought in the War of Independence against Spain. 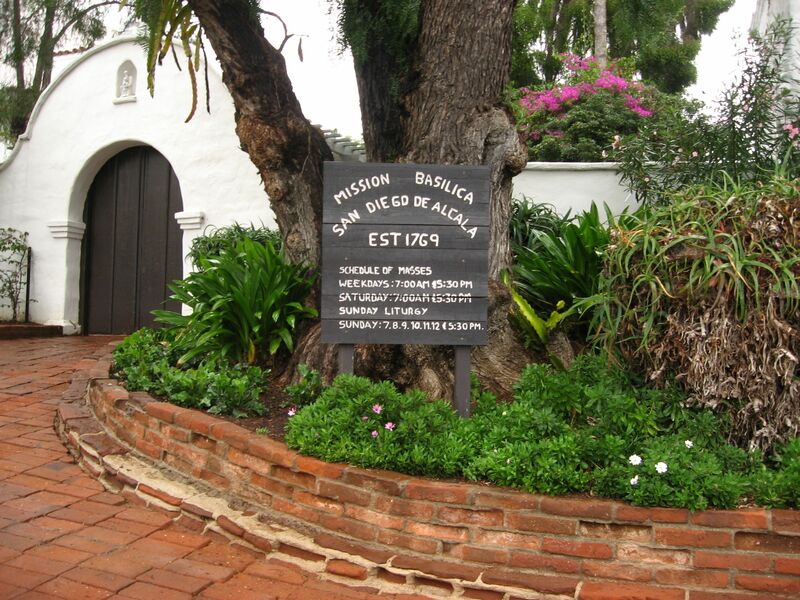 On June 8, 1846 Mission San Diego de Alcalá was given to Santiago Argüello by Governor Pío Pico "...for services rendered to the government." After the United States annexed California, the Mission was used by the military from 1846 to 1862. President Abraham Lincoln signed a proclamation on May 23, 1862 that restored ownership of the Mission proper to the Roman Catholic Church. When Mission San Diego de Alcalá was granted back to the Church, it was in ruins. In the 1880s Father Anthony Ubach began to restore the old Mission buildings. Father Ubach died in 1907 and restoration work ceased until 1931. In 1941, the Mission once again became a parish church, in what is still an active parish serving the Diocese of San Diego. In 1976, Pope Paul VI designated the Mission church as a minor basilica. Mission San Diego de Alcalá is located within San Diego city limits, near the intersection of Interstate 8 and Interstate 15, and approximately one mile east of Qualcomm Stadium. The parish is partially funded by a gift shop, and self-guided tours of the grounds and buildings are available to the public for a small donation.